Shirts With Random Triangles: Georgia lands top 2015 DT prospect Trenton Thompson for its 2015 recruiting class. Thompson is graded as a five-star DT by both the 247Sports.com composite, and ESPN Recruiting Nation. Both websites also list Thompson as the no. 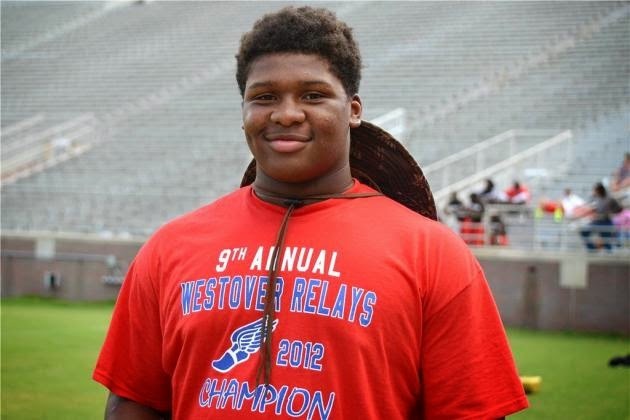 1 2015 DT prospect, and as the no.1 2015 prospect in the state of Georgia. The 247Spots.com composite ranks Thompson at no. 2 among all 2015 prospects. He ranks at no. 6 in the ESPN300. Thompson attends Westover High School in Albany, Ga. He stands 6'4, and weighs 292. He becomes the 18th member of Georgia's 2015 recruiting class.